Want to buy a touch-screen laptop but couldn't afford it? But what if I told you that you can turn your existing non-touch-screen laptop into a Touch Screen laptop? Yes, it's possible. 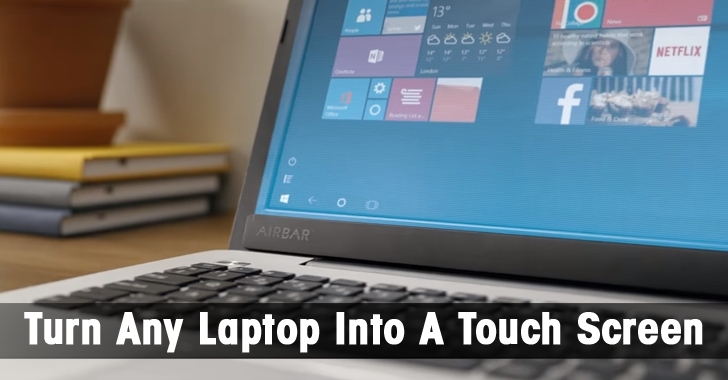 You can now convert your laptop or PC into a touch screen with the help of a new device called AirBar. Touch screen has become a popular feature on laptops these days, and many laptops are moving toward having touch screens, but not every laptop or desktop model comes with the feature. Swedish company Neonode has brought to you a new device, AirBar, that would bring the touch technology to virtually any computer from your non-touch laptops to notebooks. What is AirBar and How does it Work? AirBar is a small plug-and-touch bar that attaches magnetically to the bottom of your machine's display. When connected to your laptop via an available USB port, AirBar starts emitting a beam of invisible light across your screen that is used to track touchscreen movements and gestures. The movements and gestures are then translated into corresponding inputs, making you able to use all the gestures including poking, pinching, swiping, zooming and scrolling around with your hand, in the same way, like on a touchscreen PC. AirBar turns any laptop, computer, or notebook into a touchscreen machine, without making any changes to its hardware. You can watch the video below to know how really AirBar works. …it even works if you have worn gloves, and with any other object. AirBar works well with any device running Windows 8 or Windows 10 or even with a Chromebook, but it still needs to have proper OS X support. The AirBar is going to retail for $49 next month with its public launch in January 2016 at the CES event in Las Vegas. 15.6-inch screens size at present. Currently, the only size that AirBar accommodates is 15.6-inch screens.